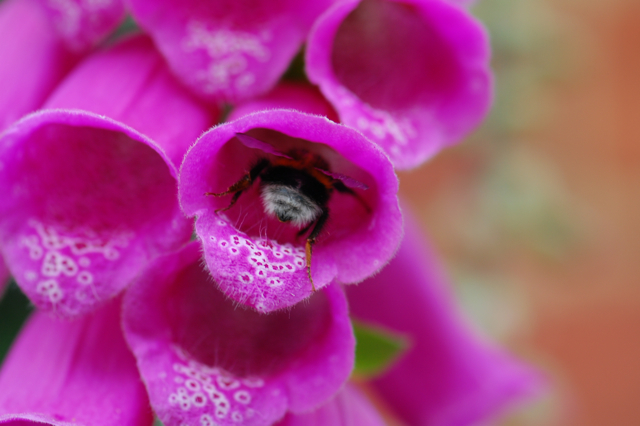 One of my favourite blogs to read is Take Time To Smell the Flowers by Cheryl. It charts the seasons and wildlife in her garden through a perfect combination of wisdom, exquisite photos and an evident love of the natural world. A quote on Cheryl’s blog reads ‘As is the gardener, such is the garden’. To my mind that must make Cheryl abundant, altruistic, beautiful and perhaps a little bit wild! 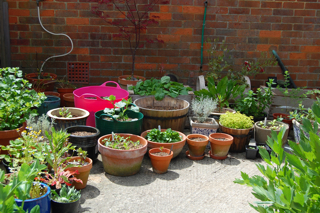 The lovely Leslie from Comfrey Cottages has also been posting about her new herb garden this week. Leslie and Cheryl have quite a bit in common from what I can gather through reading their blogs, both being gardening, animal rescuing, bee loving, super-grannying custodians of nature. 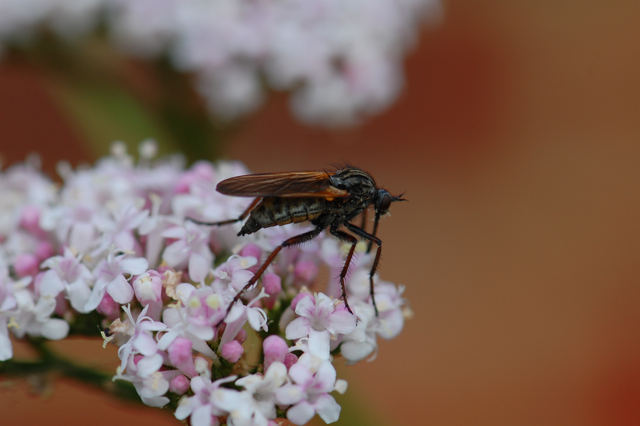 Anyway, between them they have inspired me to share a little about the changing face of my garden and it’s visitors. When we moved in last year the largest of my five beds looked like this. 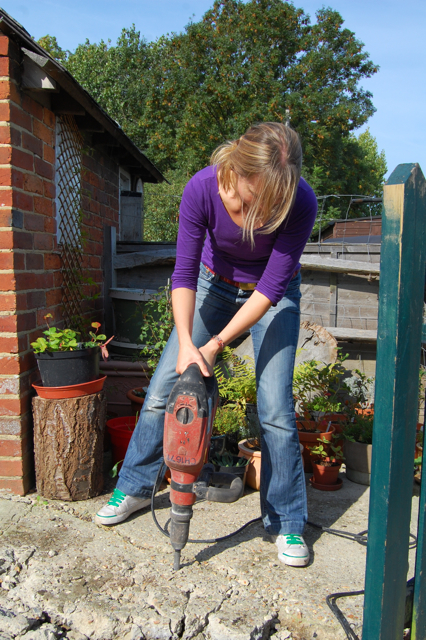 So I spent a fun afternoon with my Dad and the kango drill when he came to visit in the autumn. 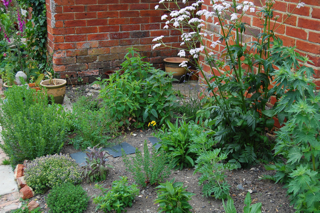 Though I’m still in early stages of working with the garden, to look on this bed now gives me great pleasure, filled as it is with Hyssop, Thyme, Lavender, Sage, Escholtzia, Valerian, Alecost, Monardas, Salad Burnett, Wormwood, Motherwort and other herbs. 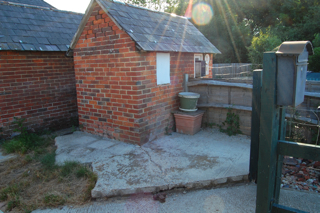 I’ve also planted a highly scented climbing rose to grow up the shed wall which i will use for tinctures and other medicines. Our narrow bed is currently housing brassicas and other veggies though I am hoping our names will work their way to the top of the allotment waiting list by next year and this bed too will be devoted to herbs and wild flowers. 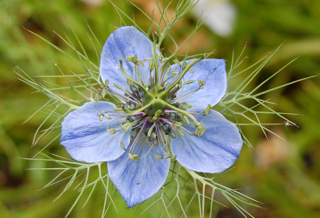 At the back of the house Nigella, Love-In-A-Mist, has just started blooming. This is one of my favourite flowers and made up the bulk of my wedding bouquet along with rosemary and other herbs. After years of city living there is still a container gardener in me and my husband has started complaining of late that we wont be able to get to the house if they spread much more. 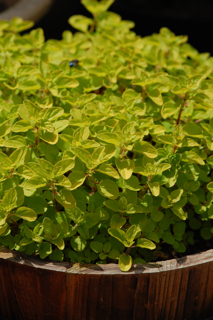 This golden marjoram has been with me for years and years and I still get so much pleasure from it’s vitality and delicious leaves. 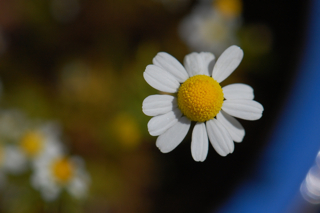 I have several pots of chamomile after it self seeded throughout everything last year. 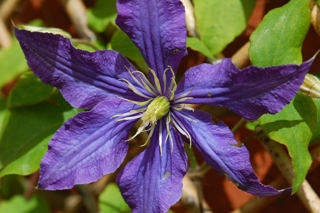 This beautiful clematis, a gift from my Dad. 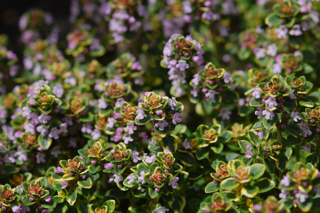 And the subtle hues of this variagated thyme. 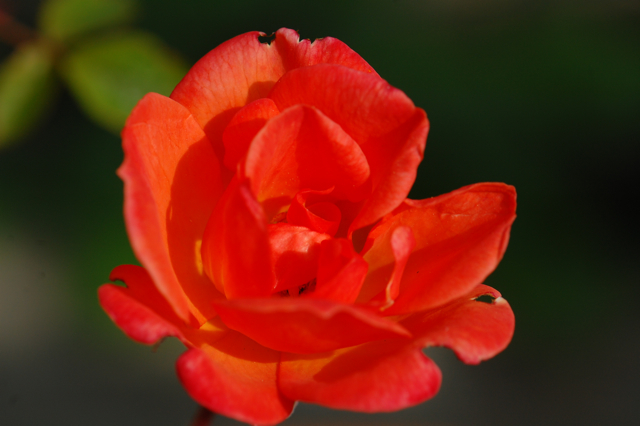 This miniature climbing rose, Warm Welcome, was bred by my uncle and is so richly coloured it seems to glow on the stems. 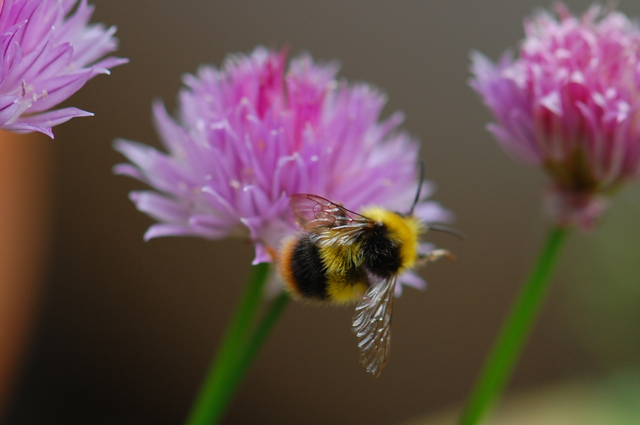 And of course what could bring more happiness than to see that others are also enjoying your garden. 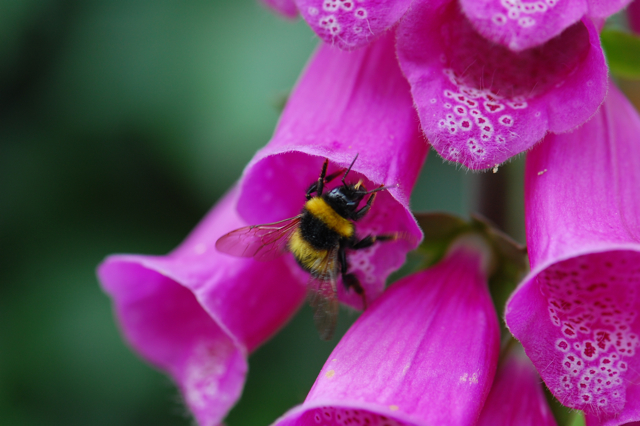 I love watching the bees lazily bumbling from one foxglove flower to the next, they look in heaven. 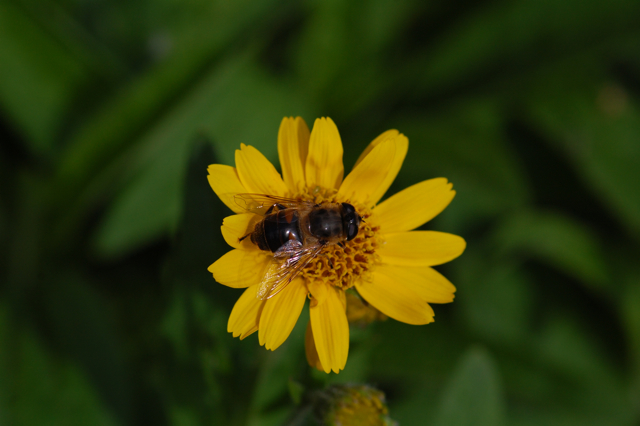 The chives and arnica are also popular destinations. 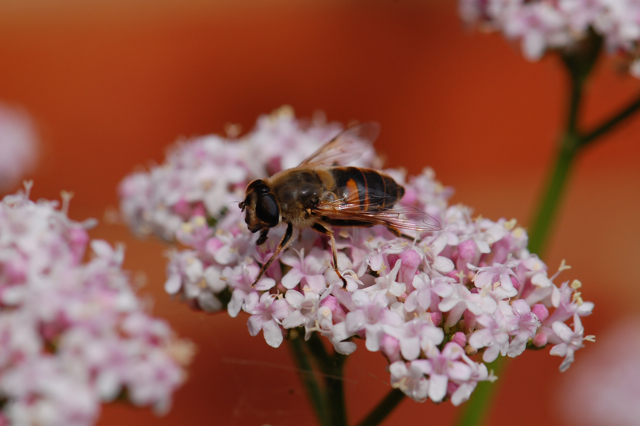 And everyone loves the Valerian. 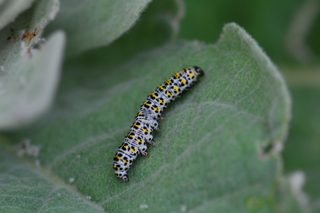 Only the poor mullein has suffered terribly this year as the caterpillar of it’s namesake, the mullein moth, has made a tasty snack of half it’s leaves. One of the most welcome of all our visitors at the moment is a beautiful nightingale who sings us to sleep every night. You can here the calls of the nightingale on the RSPB site here. 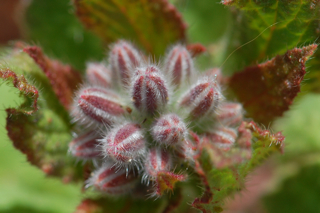 What are you finding most exciting in your gardens at the moment? Lucinda, Thank you, I am humbled by your kind words. What a pretty garden. I love the herb garden, you can never have too many herbs!! I am also a lover of containers, and have far too many. I realise that during this long warm spell. I seem to spend too much time watering them and tending their needs. Oh Lucinda, Swoon! Your garden is so lovely with the little square stepping tiles. What is the low flowering herb along the front of the bed, left side of the photo? Is that a lovely huge Valerian you have there??? I need to relocate mine because it is crowded between a rose and a Baptista but I am hesitant to do it for fear of giving her a shock. Thank you for your lovely post! I leave inspired! Thanks for sharing those beautiful pictures Lucinda. Thanks Rita, it’s a work in progress and will hopefully look better and better as times goes on. I had so much fun with the drill digging out that horrible concrete. Unfortunately I couldn’t move my neck for two days after! Perhaps a career in road maintenance is not in my future after all. 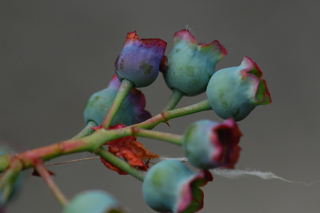 **Thanks Leslie** Do you do your blueberries in ericaceous compost and add lots of nice acid stuff like a pine needle mulch and coffee grounds? 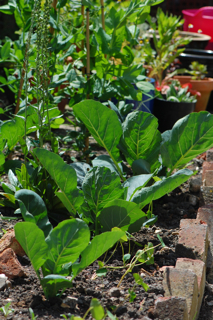 Looking forward to seeing how your garden progresses. Wow, your blog is lovely! Thanks for sharing your ideas and pictures.